Don’t be fooled! 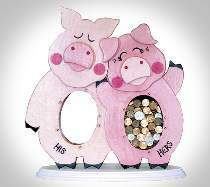 It looks like a his and hers savings bank, but wait! When you drop a coin in the “his” side, it shoots over into the hers side! Both coin slots lead to the hers side! Everyone gets a great laugh out of this coin bank! Measures 17"H. All patterns drawn FULL SIZE. Order hardware separately or see *Special Offer below.